On Sunday, March 20, , 1994, St. Stanislaus Memorial Post 1771, American Legion, held their Annual Parade and mass to honor all members who have completed their life cycle. Under the Direction of Edward Wizbicki, P.C. and current Chaplain, the Parade started at 11:15 A.M. and arrived at St. Stanislaus Kostka Church at 11:30 A.M.
St. Stanislaus Memorial Post 1771, American Legion would like to thank everyone who participated in the parade and the 11 :30 A.M. Mass. In appreciation to the “Green point Community” for their continued support, St. Stan’s A. L. is pleased to announce that the annual “Kings County Band Concert,” will be held at the American Legion Hall located at 100 McGuin­ness Boulevard on Thursday, April 28, 1994 at 8 P.M. Admission is free and coffee and cake will be provided. This is the American Legion way of thanking the community for their continued support. On Saturday, February 26, 1994 St. Stanislaus Memorial Post 1771, American Legion, Honored Past Commander Edward Johnston and Past President Lorraine Bizinski. Under the Chairmanship of Nick Stefanizzi, Sr., over 150 guests throughout the community came out to this GALA AFFAIR. Both Ed & Lorraine’ served from July 1, 1991 through June 30, 1993. Lorraine was also elected and is currently serving in the Kings County Ladies Auxiliary Execu­tive Board. Everyone appeared to have a good time and St. Stan’s American Legion, had another large crowd on March 26th “St. Patrick’s Country and Western Dance”, with Plans being made­ to guarantee just as much fun. All those involved from St. Stanislaus Memorial Post 1771 ,American Legion, would like to thank all the guests who attended this affair and hope the community will continue to support the American Legion in Future endeavors. The dance held on March 25th, at St. Stanislaus Memo­rial Post 1771, American Le­gion can only be described as A GREAT SUCCESS. Thanks to the “Greenpoint Gazette” Prominently display­ing the St. Patrick’s add, Tina Mann shopping and cooking the food, and all the workers who assisted, prior, during and, affair, helped in making this an enjoyable evening. Through the evening many people were thrown in the Post Jail. Some enjoyed the Jail so much that after their partners posted bail, they refused to leave. They were rocking in the Jail House. The dance floor appeared crowded throughout the whole evenings. The band enjoyed the crowd so much that “Lenny & Parner” requested the Post allow them to play for an extra half hour. Their request was granted. Samples of the “Green­point Cocktail” was provided. Many people tried this drink whose ingredients were described by Ralph Carrano: Editor of the “Greenpoint Gazette”. One problem did occur with the selling of the 50/50 Raffle. Although only one Prize was available, two different color tickets were sold. Due to the fact that instructions were not explained properly, some of the guest be­lieved there were two different prizes. We apologize for this unfortunate incident and have already instituted a policy which I will elevate this situation in fu­ture affairs. Over 100 guests came to the affair and the members of St. Stanislaus Memorial Post 1771, AmericanLegion would like to thank everyone who I came to this affair. The next affair at the American Legion will be our second ­ Flea Market. This is scheduled for April 9th. If you need inforation please call Rich­ard, Fred or the Post Lounge. We would like to thank the Greenpoint Community for making this a Very Successful Affair. June 6th marks the 50th, anniversary, of the greatest military invasion ever. The liberation of Europe was accomplished, and the 50th, anniversary of this D-Day will be celebrated all over the world. Vincent Tex Tyrsklewicz: 1st Infantry Division: 16 Infantry Regiment, 1st Battalion. 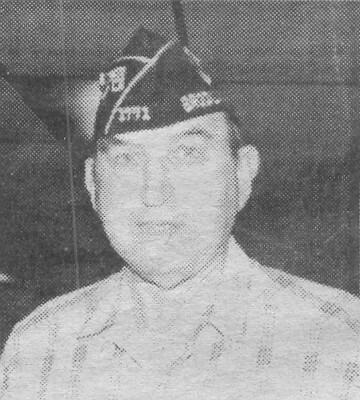 Tex a member of St. Stan’s American Legion Post 1771. Stanley Filpowicz: Landed with the 1st Infantry, 26th Regiment, Cannon Company. Stanley a member of the Green Oak’s. David Guild hit the beach with the 29 Infantry Division: 1751nf. Reg. Co. H. David is a member of the Green Oak’s. Peter Kokulak 4th Infantry Division, 42 Field Artillery Battalion, landed on Utah Beach. Peter is also a mem­ber of St. Stan’s American Legion Post 1771.
operation on June 6, 1994. The First Division from the beginning. then Omaha Beach in Normandy. the GI’s a great deal of trouble. Many times I’ve been asked that question. What astonishes me was some of the people who asked, worked for city principalities. Well, this column is about The American Legion. The American Legion is an organi­zation consisting ONLY of veterans who served in the armed forces during a conflict. WWI; WWII: Korean War: Vietnam War: in Panama: Granada: Desert Storm, up to the present. Today, the average lifespan is 75 years. The American Le­gion is 75 years old and getting stronger, with over 3.1 million members. The American Legion was founded in 1919 ‘at the conclusion of WWI. The war that was suppose to end all wars. The Legion was founded by veterans who believed American ideals of justice, freedom and democracy must be preserved for all times. When WWI veterans came home it was the American Legion who pushed for a Federal Veterans Bureau that is now known as the Department of Veterans Affairs. What organization began sponsoring Boy Scout troops, when young people needed guidance way back in 1919 and what organization is the chartering agency for Scouting units involving more than 66,000 : boys? Of course! The American Legion! In 1923, the American Legion drafted the first flag code. We are now in the forefront to I gain’ a constitutional amendment to protect the flag! More people than ever before attend college and improve the standard of living for gen­erations to come because of the American Legion who drafted to original GI Bill of Rights. In 1925 a youth program was established. American Legion Baseball!! It became the train­ing ground far 65% of today’s professional ball players. Did you ever hear of Boys State? Boys Nation? Created by the American Legion, it gives the young boys an excellent idea of how a country is run. National High School Oratorical Contests that foster greater, understanding of the U.S. Constitution. Thousands of dollars in scholarships are presented to the winners every year. In 1966, yes, 28 years ago., The American Legion spoke out about the fate of America’s POW’s/MIA’s in Vietnam. The American Legion took the Federal Government court for its failure to pursue the effects of Agent Orange an Vietnam Veterans. We farmed the “Family Sup­port Network” to assist the families of service men and women deployed during operation Desert Shield/Desert Storm. The American Legion will continue to fight for adequate funding, far veterans who served their country. We, in the American Legion, call ourselves Legionnaires be­cause we are part of that great unbroken line of citizen-soldiers who returned from military service to do battle on the home front for the preservation of a great America. We’ve fought far a strong military; far veter­ans benefits and worked far the moral upbringing of this nations future, our children and our youth. The American Legion, what’s that!? I hope I have clarified the answer somewhat. Special “THANKS” to. Dept. Finance Officer Anthony J. Minei for all the data. Kings County American Legion held it’s 75th Convention on June 17, 1994. The honor of hosting this Convention was given to S1. Stanislaus Memo­rial Post 1771 located on McGuinness Boulevard in the Greenpoint Community. Delegates throughout the Brooklyn American Legion Community came to renew old friendships, discuss future plans for Kings County and present awards to individuals and Posts for outstanding service to the Legion. However, the most important function of this Convention was the elec­tion of a new slate of officers whose assignment will be to keep Kings County in good standing in the American Le­gion family. After presentation and “Salute to Colors,” the Convention began. Awards were disbursed to both individual members and Posts, A keynote speech was also given by Robert Di Carlo a New York State Senator and Chairman of Veterans Committee. After all formalities were completed, nomination and elections was the final order of business. Candidates were nominated for each position on the “Kings County American Legion Executive Board” and elections followed the conclusion of nominations of each position. Conclusion of Election” of Officers produced a new Kings County American Legion Com­mander. This new Commander is Angelo Del Priore of Windsor Terrace Post No. 1175, who will hold this position for 1994­1995 Legion year. After the new slate of officers were sworn in, and the “Colors Retired,” the convention was closed, and the celebration commenced. All Delegates retired to the Post Lounge where the old and new Officers were congratulated. This was the final function of the Kings County American Legion Year which ran from July 1, 1993 through June 30, 1994. On June 30,1994 my tenure as Commander of St. Stanis­laus Memorial Post 1771 American Legion will have reached its conclusion. I have thanked the membership many times for having the confidence to elect me Commander of the largest American Legion Post in Brooklyn. However, the Greenpoint community and the Greenpoint Gazette assisted in making this a very enjoyable year for me and I would like to take this time to thank everyone involved. Many projects were attempted this year that had not been attempted in recent years. Thanks to the Greenpoint com­munity, most of the projects were a success. The Greenpoint Gazette as­sisted in making the last year very successful by prominently displaying our ads and printing our articles about the success of our projects. To start off the new legion year. In addition, St. Stanislaus Memorial Post 1771 American Legion will be allowed to hold a Halloween party, Christmas party, 50’s Dance, St. Patrick’s Country and Western Dance and a number of Flea Markets. September will mark the return of the Carnival, which was absent for over a year. This Carnival will be for eight days over two weekend’s period. One of the weekends will be during the September Street Fair on Manhattan Ave. Hopefully, after completing your visit to the Street Fair you will be able to join us at our Carnival at 100 McGuinness Boulevard. Finally the Jr. Past Commander’s Dinners scheduled for February 25, 1995. Hopefully the entire Greenpoint community will be able to join us on this day. As you can see, the next year will be very ambitious. Hopefully, whenever you are free you will consult the Greenpoint Gazette and join us for the func­tion St. Stan’s Memorial Post 1771 A. L. is running at that date. Thank you again for all your assistance throughout this past legion year.